Earlier this month, we had the great pleasure of being invited to Los Angeles to participate in a number of speaking engagements organized by local advocates StreetsblogLA and Santa Monica Next. Throughout our time there, we learned about the similarities between our two cities, and one significant difference: while Vancouver made a conscious decision to link its city centres with fast, frequent public transit, Los Angeles opted to build an expansive and expensive freeway network, resulting in a sprawling, car-dependent metropolis dissected by 19 different freeways. But it is those conditions – where the average driver spends 90 hours per year stuck in traffic – that have Angelenos dreaming of a better way. 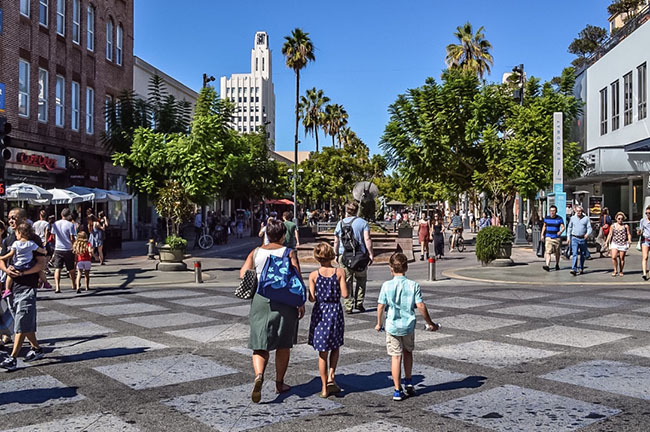 When Eric Garcetti was elected Mayor in 2013, one of his first acts was to launch the Los Angeles Great Streets Initiative, a bold program designed to transform the city’s 7,500 miles of underutilized, underperforming streets into places that welcome all modes. They began by engaging with stakeholders along 15 streets, first on a temporary basis (with plazas and parklets), and then making long-term changes to curbs, street lighting, street trees, and furniture. We visited one such street in front of the Grand Central Market on Broadway in Downtown L.A., where a row of on-street parking had been converted to a public plaza. It was truly amazing to see this space, once used for automobile storage by a handful of citizens, now being enjoyed by dozens of market-goers of all ages and economic means. In 2008, L.A. voters did something truly extraordinary. They went to the ballot box and approved – by two-thirds majority – a half-per-cent sales tax increase to pay for $36-billion worth of transit investments over the next 30 years. And we saw the evidence of that construction everywhere we went; in what is currently the largest mass transit expansion project on the continent. 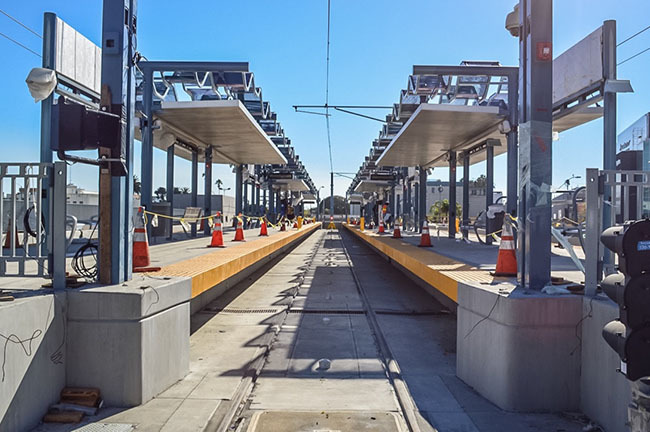 Whether it’s the extension of the Expo Line all the way to Santa Monica Beach, or the addition of seven Purple Line stations, a dedicated transit fund is playing a crucial part in expanding a system that already serves an amazing 1.4 million customers per day. Inspired by Bogotá‘s weekly Ciclovía event that opens up miles of city streets for walking and cycling, L.A.’s own CicLAvia recently celebrated its fifth birthday. Each event takes place in a different community, attracting upwards of 100,000 people, and acting as a “real time rendering” to help residents experience their city in an entirely different light. 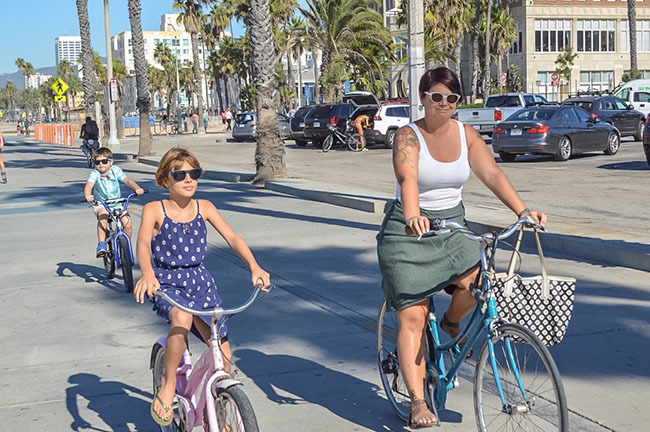 Furthermore, one study found CicLAvia significantly improves air quality in the host neighbourhood, with a reduction in harmful particulates known to cause respiratory and cardiovascular disease. Speaking with local advocates, many agreed that CicLAvia played a central role in changing hearts and minds of Angelenos to strive towards a more multi-modal city. Just last month, City Council approved a sweeping new transportation framework, named the 2035 Mobility Plan, by a vote of 12-2. The plan calls for the promotion of walking, cycling, and mass transit, in part by reducing automobile lanes, reducing speed limits, and establishing a number of bus-only lanes. The plan also adopts a Vision Zero approach, which seeks to cut the fatality rate from traffic collisions to zero within 30 years. Finally, the plan calls for 330 miles of protected bike lanes, a move we believe will go a long way to establish the bicycle as a reliable, accessible, and normal means of transportation. We have long touted the benefits of bike-share, after experiencing it firsthand in Montreal, Washington DC, and San Francisco; arguing that it serves as a perfect extension of public transit, for the first and last mile of a trip. L.A Metro stands to become the first transit system in North America that formalizes that relationship. In 2016, they will launch a bike-share fully integrated into their transit fare system, where a trip on the bike is considered a transfer, seamlessly accessed with a tap of the user’s fare card. 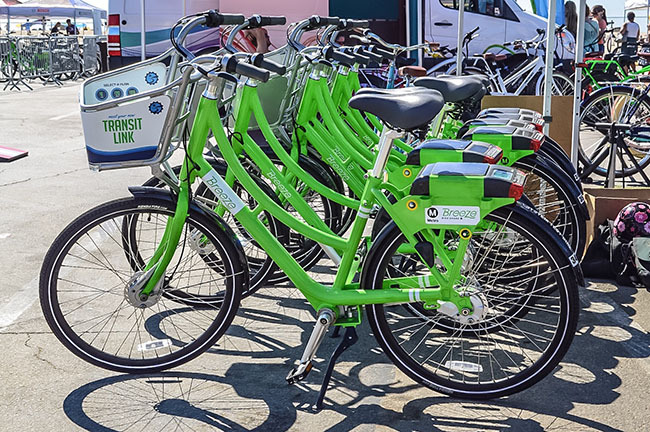 It is an important step in the evolution of bike-share, and one we hope transit agencies across the continent will emulate. Located an hour south of downtown L.A., Long Beach has been building protected bike lanes long before they were recognized by NACTO. The demand for such facilities was established through an innovative Bicycle-Friendly Business District program, the first in North America. 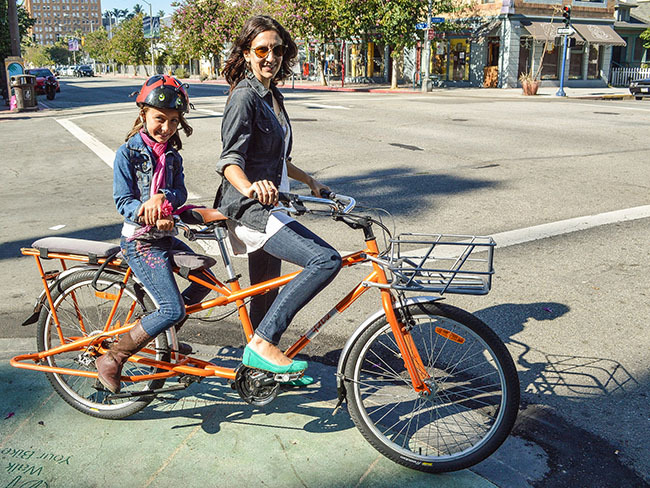 First, Long Beach city staff bought bikes for merchants to run errands and make deliveries. By allowing them to experience the benefits and challenges of cycling their streets, they became supportive of growing the bike network into a number of highly travelled retail areas. The program also included retail and dining discounts, the conversation of on-street parking into parklets and bike corrals, and cycling woven into events and marketing in other creative ways. All of this has eased the city’s shift to pleasant, calm, more walkable streets; as part of a ‘complete streets’ transformation that has increased everyone’s bottom line.